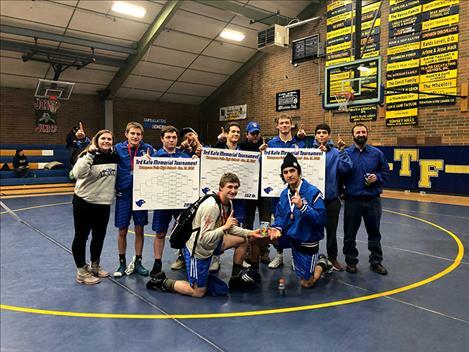 The Mission-Charlo wrestling team ranks number one at the Ted Kato Invitational meet in Thompson Falls on Saturday. THOMPSON FALLS – Mission-Charlo crowned three champions and edged Flathead for the team title at the 10-team Ted Kato Invitational wrestling tournament hosted by Thompson Falls High School on Saturday. The Mission-Charlo Bulldogs scored 112 points. They were followed by Flathead with 107.5 points and Missoula Big Sky with 101. Mission-Charlo’s Isaac DuMontier (152 pounds), Isaiah Alik (170 pounds) and Miles Anderson (205 pounds) each won their weight classes. Walker Murphy (120 pounds) and Darwin Adams (145 pounds) picked up runner up points. Troy Matt (170 pounds) captured third place for the Bulldogs. The Arlee Warriors also competed in the tournament and finished ninth as a team with 48 points. Colt Crawford (138 pounds) and Demetrix Austin (160 pounds) both grabbed second place. Tyrel Thomas (103 pounds) nabbed a fourth place finish for the Warriors. On Saturday, the Ronan Chiefs and the Polson Pirate wrestling teams also took part in the two-day Class A Duals in Belgrade. The Pirates finished in fourth-place. In pool action on Friday, the Chiefs fell 36-27 to Hardin. They defeated Billings Central 39-24 and Livingston 40-15 but fell to Frenchtown 51-16. Polson finished the day 4-0. The Pirates defeated Browning 57-12, Stevensville 71-6, Glendive 63-12 and Laurel 39-34. During the championship brackets on Saturday, Polson opened with a 47-27 win over Hardin and a 54-22 victory over Corvallis before falling 64-6 to Sidney. The Pirates finished fourth after falling in a very close match to Havre 36-34. In the consolation matches, Ronan fell 42-27 to Browning and 59-18 to Belgrade.